2019, February 9: One Big Goldfish! 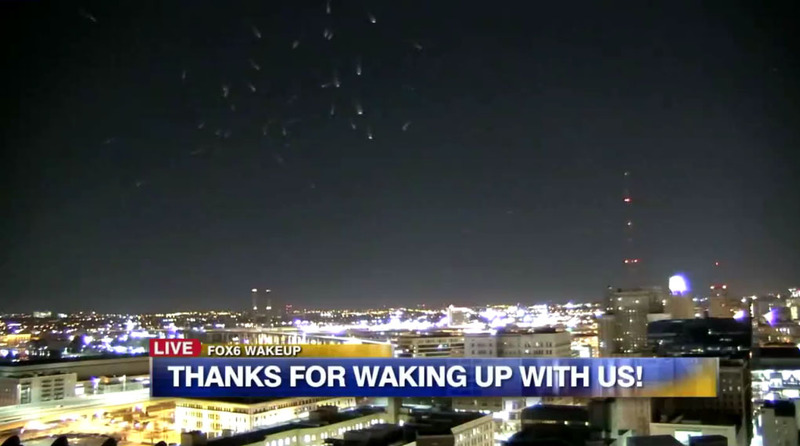 Around 4:43 AM on February 27, 2018, some of the station crew at the Fox6 News channel, in Milwaukee, Wisconsin, USA, noticed something -- somethings -- odd in the sky over the city from one of the station's tower cameras. The footage was aired live on their 'WakeUp News' morning show, and caused more than a little head scratching. After the footage had been shared, one of their viewers contacted the station to point out that something very similar was seen in their morning show footage of February 21, around 5:27 AM. Sure enough, when reviewed similar odd phenomena could be seen, though it wasn't as clear as the later footage. Later on the 27th, it was found that one of Fox6 News' reporters, Amy DuPont, had been downtown filming footage at the same time the tower camera had captured the strange aerial display. Specifically, DuPont was filming a large flock of seagulls that were flying around the Milwaukee County Courthouse, and she felt that this was the answer to the question of what the camera had seen. The footage soon spread far and wide as Reddit, Facebook, and Twitter users argued over what was being shown; many argued against the possibility of birds for the simple reasons that the objects don't look like birds -- more like orbs -- and that they appeared to be leaving light trails as they moved. To give you an idea of how far the footage spread in just a week or so, I first ran across it while tracking a different story through a Spanish language Brazilian paranormal weirdness page in Facebook! On March 1, the UK news site Daily Mail reported what a Twitter user had postulated: that the phenomena was, in fact, birds. The theory put forward was that because the tower camera was set to try and brighten the image of the night sky, it resulted in the white seagulls appearing to glow... and that the shutter speed of the camera was responsible for the "light trail" effects, just an artifact of how the footage was captured. This argument didn't convince everyone, however, as further comments quickly refuted the explanation. So that's where this oddity currently stands. For a little historic perspective on the question, I'd like to mention that birds in the night sky have been mistaken for an odd flying object before... and well before anyone would have been filming it. In 1895, a flock of birds flying low over a newly electric-lit city at night eventually led to the legend of the "Crawfordsville Monster"; more on that at the 'See Also' link below!